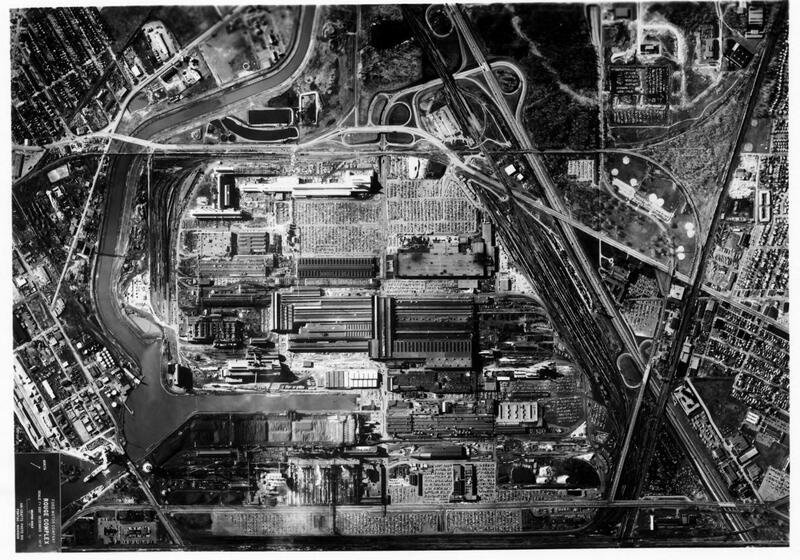 So my problem was – yes I was going near to where Max was waiting for me – but on a tight business schedule I did not know if I could find the time to set out to take a look at her. But then – everything seemed to come together – I found a place and the time to rent a truck & trailer, weather was ok, a free evening showed up and so I went out into the countryside on that Sunday evening in early May 2015. After two and a half hour driving out of the big city I finally pulled up to the house of the owner. Together we took a look at her, everything was as expected, no surprises. So the deal was perfect, up on the trailer she went and just after nightfall I was back on my way into the city and to the place where Max would be waiting to be picked up for shipment to Germany. That journey back alone was worth it all, if you and I meet some day, I must tell you the story in person. It involves cooking trailer brakes, a super-helpful gas station guy, a super-correct young police officer who pulled me over, unloading Max alone at the company and some raised eyebrows the next morning. 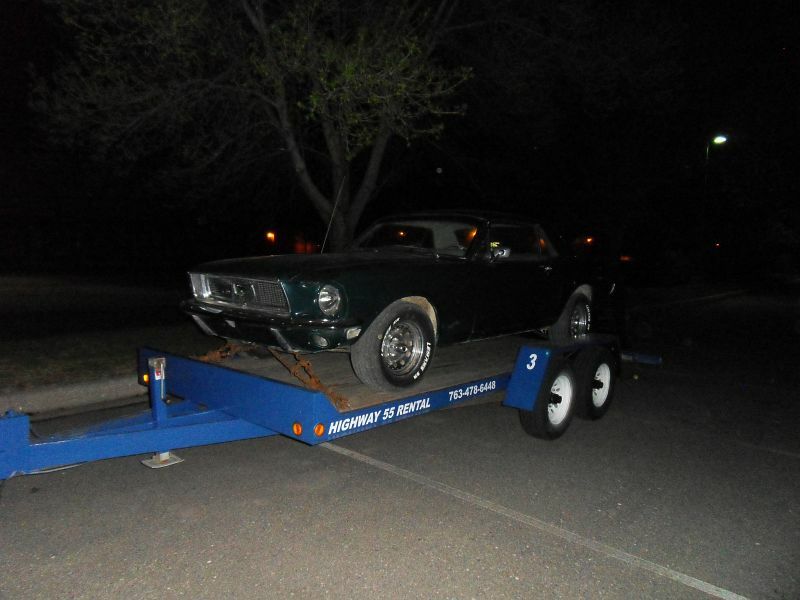 For me it was worth it all, I had found exactly the Mustang I was looking for, Max. 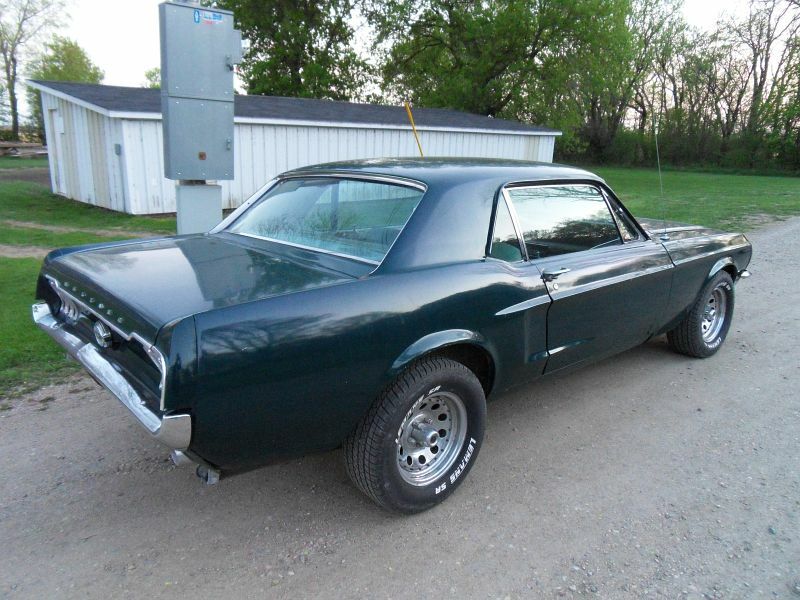 So Max was bought in 2003 in Mason City, Iowa by her previous owner. When he moved (back) to Minnesota he took her with him. But Max didn’t see much of the streets of Minnesota as I was told by her previous owner. 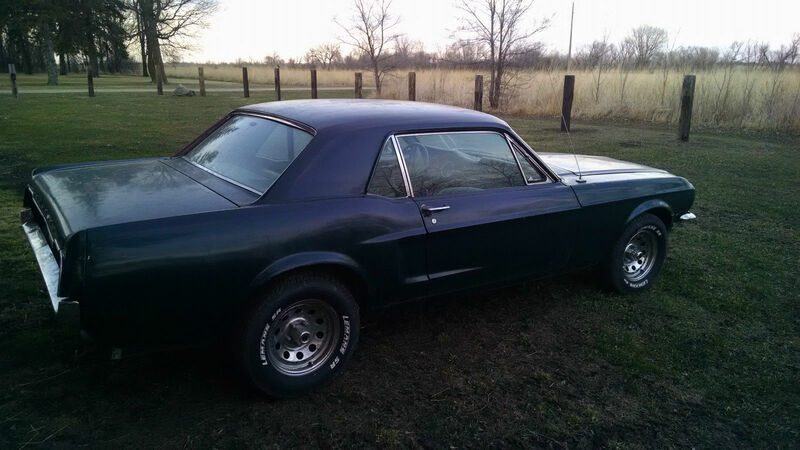 He took care of her, fixed some things, got her licenced and stored her safely in a barn. After around 12 years of having her (2003 – 2015) he found that he might not have enough time and finally decided to sell her. Thats when I enter the story. 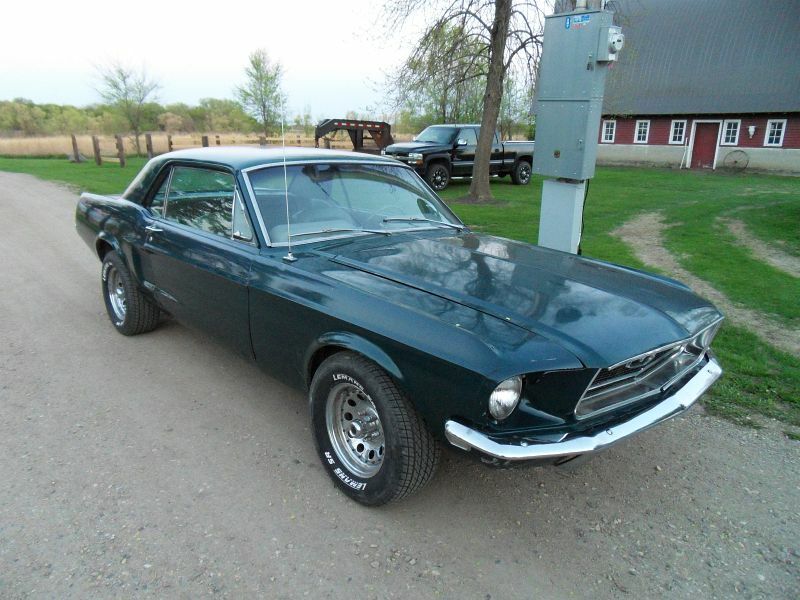 I had already been looking for a Mustang Coupe, V8, build years 1967 / 1968 for quite some time at that moment in early 2015. There were lots of cars available on the market in Germany, in various states of preservation and within various ranges of pricing. None really caught my eye, not a single one caused that „click“ of „must-have“. That’s when I found Max on a large internet platform. In an act of frustration I simply had ommited the limitation of only searching in my home country and changed the search criteria to „worldwide“. There she was. She instantly looked like the perfect match. Technically mostly ok and running, in need of some attention to body and painting. I made contact to the owner, we talked about pricing and details of her state of preservation. After we came to an agreement I took a look at her location and to my surprise it was in a reasonable distance to a place I was going to in the US anyway. 1968 to 2003 – What happened to Max in between these 35 years remains a mystery – at least until now at the time of this posting. The only information that seems secure at the time of this writing is that Max has been with a family that lived in Mason City, Iowa. Rumor has it that she went through 3 generations in the same family within that time. From grandfather to father to son and back. Looking at a map all this seems to fit the mould. Mason City is not that far away from Des Moines where Max most likely has been sold as a brand new car from some yet unknown Ford dealership. But was someone in this family the first owner of Max? – Unknown. All I know is that she was bought in 2003 by her previous owner in Mason City. 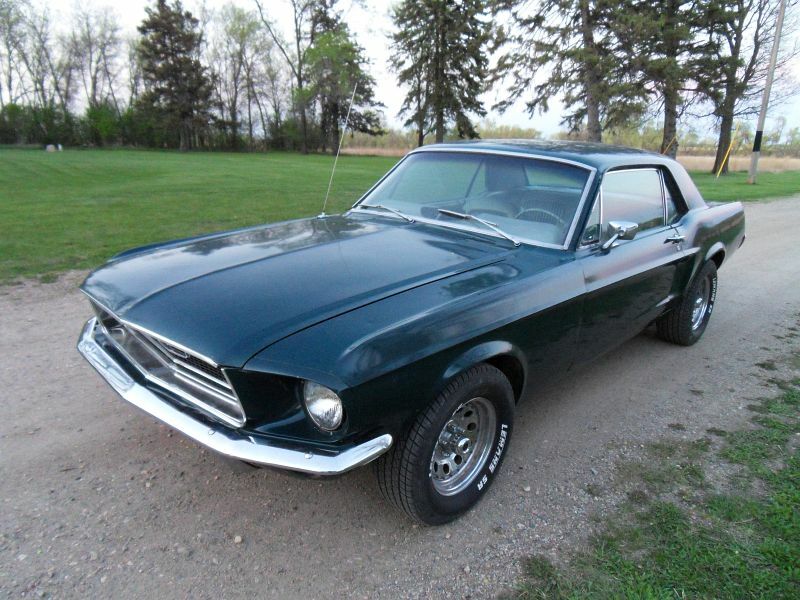 Have you sold a dark green Mustang ’68 Coupe in Mason City about the year 2003?